John is a award-winning filmmaker, animator, and artist who created several award-winning Star Wars parody films and has also worked professionally on such varied licensed properties as Babylon 5, Crimson Skies, MechWarrior, and Star Wars. He's worked for years in local television promotions and production, but it is his freelance efforts through which he's achieved some notoriety in science fiction circles. After doing many SF-themed videos for conventions in the late 80s and early 90s, Hudgens made a Babylon 5 music video as a personal project in 1994 and sent it to show creator J. Michael Straczynski, who turned around and hired Hudgens to continue creating the videos. Straczynski used them in in his convention presentations, and one served as the series' demo reel for the move to TNT. They collaborated on eight total over the run of the series. 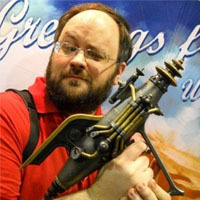 John won the Audience Choice Award in Lucasfilm's Official Star Wars Fan Film Awards in both 2003 and 2005 for his parody films The Jedi Hunter and Sith Apprentice. Another parody, Crazy Watto (made with Men in Black creator Lowell Cunningham) played at the 2005 Cannes Film Festival to help promote the premiere of Revenge of the Sith. John designed cut-scene animation for Microsoft's hit PC flightsim/adventure game Crimson Skies in 2000. He has since worked on several projects for WizKids Games, including packaging designs for the Crimson Skies game miniatures, artwork for a MechWarrior coffee table book, and animation for the Creepy Freaks and Pirates of the Spanish Main game miniatures commericals. In 2007, he provided most of the ship artwork for the miniatures in WizKids' popular Star Wars PocketModel trading card game. He has recently done some design work for Smith & Tinker.